Budget Fence and Gates accommodates a wide variety of fence repairs for both home and businesses in the South Florida area. Keep in mind however that we are also a full service fence company. If you’re looking for wood fence repair, a new or replacement fence, wrought iron fence, chain link, brick or any other fence style, you have chosen one of the best fencing companies in the West Palm Beach area. Our fence installers have a working knowledge of every style fencing imaginable. Budget Fence and Gate Systems will even work with you to design a custom one of a kind fence or gate that suits any purpose or individual style. Often when faced with a broken gate that just won’t close or a leaning fence, a consumer will find most fence companies have a minimum service charge or your project is too small. You begin to understand getting a fence company out for such projects can be a daunting task. At Budget Fence and Gate Systems we specialize in fence and gate repairs. No project is too big or too small for us to handle. We will be delighted to replace a bad gate latch or to replace an entire gate system. A homeowner’s driveway gate is just as important as our business clients who have a broken security gate. So if you need a gate fixed or a new gate installed, if you have a fallen section of fence or need a brand new fence, give us a call today. Budget Fence and Gate Systems makes every effort to accommodate the needs of our customers. When homeowners find themselves forced to replace a fence due to circumstances, often it’s not in their budget to drop a few thousand up front. HOA letters and fines can be intimidating as well. Usually replacing a section or two of wood fencing which faces the community will stop these letters and satisfy your HOA. 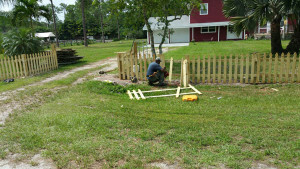 We can install your new fence one section at a time to ease any stress on your schedule or budget. Often small fence repairs can be handled on the initial visit. Most new and replacement projects, under 500 ft, can be completed within one week.